The benefits of trees far outweigh the drawbacks; however, there are some dangers or hazards that are inherent in trees. For example, trees can fall and damage homes or property, or worse—injure people or animals. Most trees do not and will not fall; however, the risk is there, particularly in times of hurricanes and tropical or severe storms. A Certified Arborist can help you determine if your tree is at risk. Additionally, a Certified Arborist can provide post-storm cleanup to safely remove fallen trees or branches. As a property owner, caring for your tree and knowing the risk is your responsibility. The following information will help you determine if you have a potential hazard with your tree; however, you should consult a Certified Arborist such as Paul Oklevitch of Snip's Tree Service to accurately assess your risk and determine what your tree care needs are. If your tree exhibits any signs of being a tree hazard, contact Snip's Tree Service to confirm. Snip's Tree Service will fully examine the tree, determine the risk and true hazard level of the tree, and determine what course of action is most appropriate to eliminate the risk. Tree removal and stump grinding services are available at affordable rates—call for details. Is My Tree a Hazard? Does my tree have a dead branch or branches? Are there any branches detached, but still hanging in my tree that could fall? Is there any rotten wood in my tree (especially on the trunk or large branches)? Does my tree have any parasites such as mushrooms near the base? Does my tree have splits or cracks where the branches intersect with the trunk? Are there any other trees in close proximity to my tree that have recently died or fallen? Is my tree leaning in one direction? Do most of the branches originate from the same side of my tree? Has my tree been excessively pruned? Does the leaf growth on my tree appear normal or unusual in color or sizing? 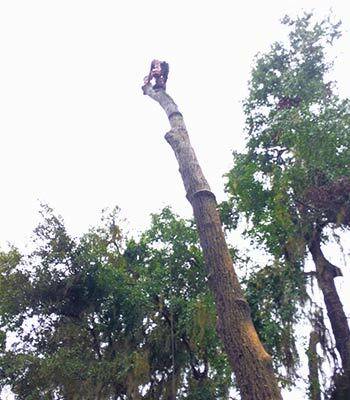 Contact Snip's Tree Service at 904-268-1017 to determine if your tree is hazardous. Note: Information about the risks of hazardous trees provided courtesy of the ISA.